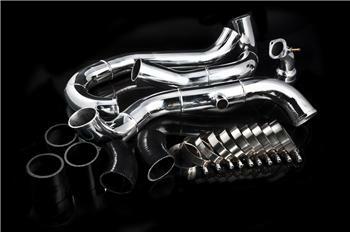 Weapon-R Intercooler Pipe Kit - Dezod Motorsports Inc - Home of the automotive performance enthusiast since 2002. The Weapon-R Intercooler Pipe Kit offers improved airflow, faster boost response and higher boost pressure at redline compared to the restrictive OEM rubber charge pipes. In addition to the performance benefits, each pipe is hand polished to a show quality finish. Kit includes 3 Ply fiber reinforced silicone couplers, T-Bolt clamps and all mounting hardware needed for installation.